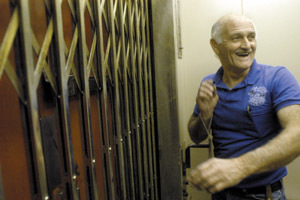 Never understood why every elevator operator man looked like he came from an old age home. "Hi, Mr. Elevator Man... How's your day going?" "It has had its ups and downs..."
Anyway, I lived in the Portland area until a couple months ago, and at least a couple of the older buildings downtown have those accordion-style elevator doors... But no operators. 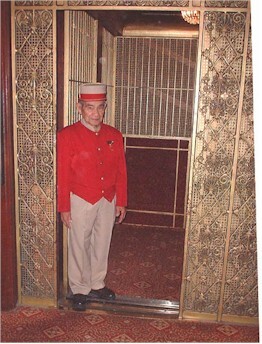 The Supreme Court building located at 80 Centre Street in downtown Manhattan still has an elevator operator. The building was recently renovated, the elevators too, but they still use the operator. Good stuff. So there's at least one out there. The last place I remember seeing them was at the old B. Altman emporium at 34th and Madison in Manhattan, but that was back in about 1970. It was always amusing to see how the operator used that rotating handle to line up the floors before he or she pulled open the gate. I have a nagging feeling that, somewhere, there are still elevators with those accordion gates, and they've probably still got operators. Maybe some hotels, or large department stores? Last place I ever worked that had elevator operators was in an old skyscraper office building at 295 Madison Avenue, corner of 41st Street, in Manhattan, back in 1959.